What lies at the threshold between life and death? How will we be remembered? Big questions, to be sure, but Unexpected Productions’ Afterlife: Life and Death…Improvised tackles them with humor. This interactive comedic production is an exploration of death, dying and how we choose to live. The cast uses comedy to help you reflect on your own life and death. 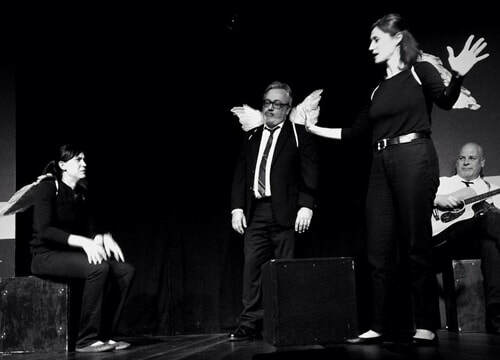 The improvisers examine the traditions, taboos, myths, legends, and assumptions about life, death and afterlife. Unexpected Productions is Seattle’s oldest Improvisational Theater Company. Today, Unexpected Production is producing a wide array of improvisational-based theater for Seattle audiences, and has developed a worldwide reputation for high quality improvisation. Comedic in style, Unexpected Productions focuses on the art of storytelling in its work. Afterlife was created and performed in the Fall of 2018. Afterlife stars Cynthia Lair, Dave Clapper, Guy Nelson, Jessica Landkrohn, Mara Siciliano, Rich Hawkins, and Sarah McMahon.